The summer of 1985 was great. Getting ready for the annual trip to Cedar Point was one of the highlights until we moved closer and got Season Passes. There was a new roller coaster that year and I really wanted to ride it. 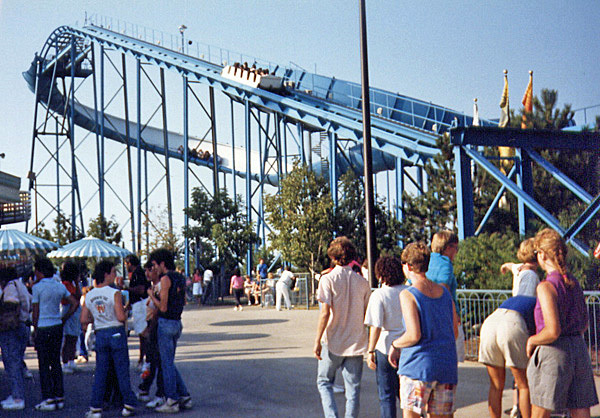 It was called Avalanche Run and it looked so different from all the coasters I had seen before. Today and it is a shadow of its former self. This will also be the last year it is going to exist. This last weekend the word went out across forums and the Sandusky Register that Cedar Point will be removing the Disaster Transport and the Space Spiral to make room for a new coaster. I thought I would take this chance to go outside ride chronology I was using and write my memories of the ride. The roller coaster is of the bobsled design, meaning the wheels are not attached to a track as on a conventional roller coaster. The cars—resembling bobsleds — operate within a steel trough, on which they are allowed to operate freely. This allows the ride to swing from side to side when turning sharp corners, as an actual bobsled would. Let’s head back to the Summer of 1985. We arrived at the park and from the parking lot I could see this marvelous blue ride. Getting into the park it was situated right next to Kid Arthur’s Court. I would love to say that I rode it immediately, but I don’t remember. Avalanche Run did flip my world a bit. My parents always had a system when it came to rides in the park. My dad would always take me on the roller coasters. My mother on the hand would take me on all the spinning the rides. My father as he got older couldn’t handle the spinning rides at all. Keep in mind that in 1985 he was nine years younger than myself. I have inherited his genetic handling of these spinning rides. So while my mother was taking my little brother on the kiddie rides, my dad would take me to wait in the long lines. Besides random camping trips this was probably the most bonding my father and I had when I was a kid. My mother never had any interest in roller coasters. What she did was take me on all the spinning rides that my father could not handle. When it came to rides like bumper cars it was a toss-up who take me on. I was also at the tail end of riding the kiddie land rides also. It was a great time to be a kid. I managed to ride all the rides I was tall enough to get on. More rides than either of my parents. 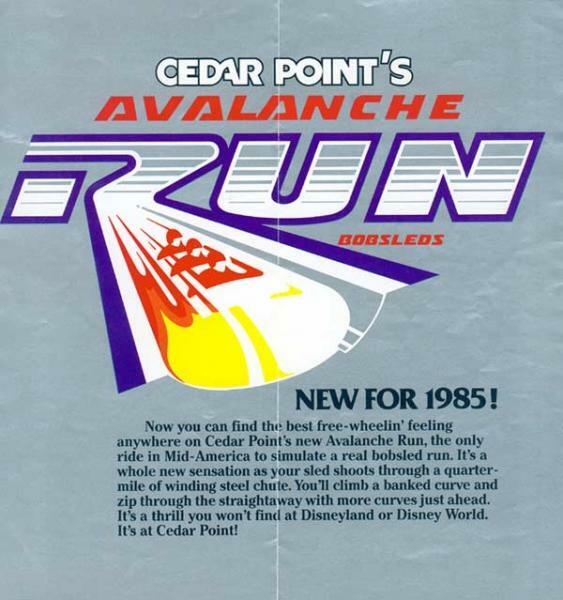 In the strange case of Avalanche Run I think my father only took me on the ride the very first time. Every subsequent ride my mother went with me. For some reason she just loved this coaster. In the following years until I was wandering off by myself my mother always rode this with me. I don’t normally write fondly about my mother, but this was a great time I had with her. Bonding with my mother, bonding with my father – roller coasters are the great family experience. Opening weekend that year I’m studying the map to find out where this new coaster is. I was confused. It showed that it was right where Avalanche Run was. 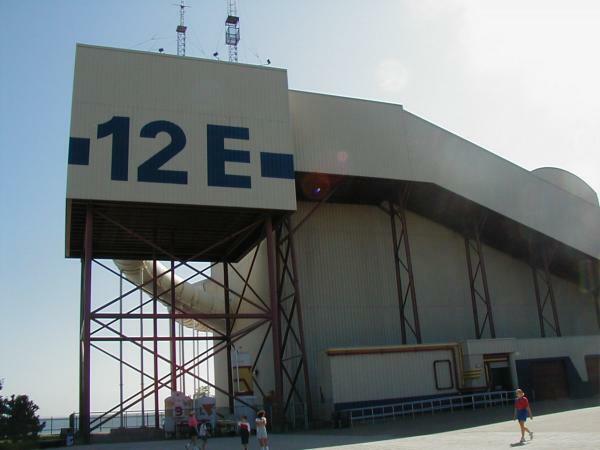 As we made it to the parking lot I couldn’t see the familiar blue sight along the beach. It was seeking in. They tore out Avalanche Run and replaced it with something that looked like an industrial building in the distance. 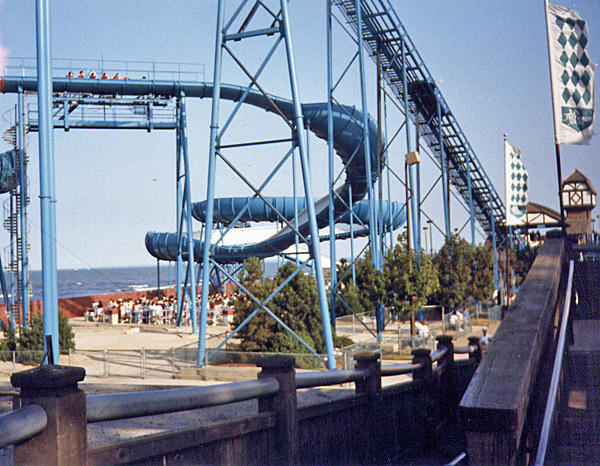 Cedar Point constructed an enclosure to keep the sand and elements off the track. I guess over the four years of Avalanche Run’s the elements were causing havoc with the track. The solution instead of losing the ride all together was to build an enclosure around the ride. It has operated this way for the last twenty-two years. When the enclosure was new they really worked at selling this ride. I’m assuming the inspiration to go with a science fiction theme was Disney’s Space Mountain. They embraced the theme completely and delivered an experience unlike you have ever seen since in the park. 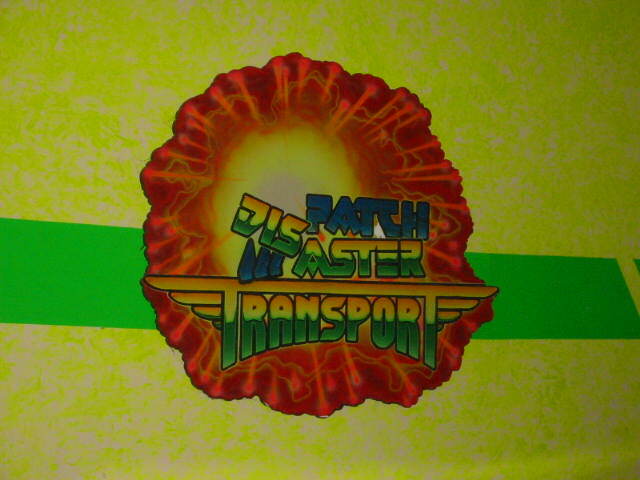 The logo where Dispatch Master is broken to say Disaster Transport. The I idea behind the theme is that there was that there is a transport line from Cedar Point to Alaska. The slogan is “We get you there in five minutes or we don’t get you there at all”. The queue line was divided into four sections. Every fifteen minutes they would move you to a new room. The side effect of this was a ride that normally had a fifteen minute wait jumped to a mandatory forty-five minutes. I couldn’t find pictures of all the areas, but I will do the best to go through them one by one. The first room was staged like a boarding area of an air line. There were post-apocalyptic posters up of cities such as New York City and Rome in the entrance walkway. There was a podium were a worker was standing that gave a spiel that described the main walkway was damaged and they would be routing us through to the transport the back way. 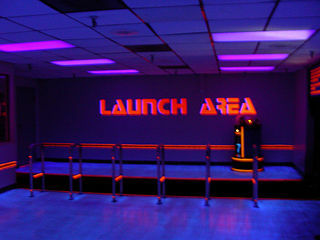 This room was filled with black lights and in later years they would try to sell you little light up toys and neon bracelets that would react to the black light. The next room you went through was the control room. In this room was a video playing describing the operations of the transport. A captain of the ship was giving the presentation. At some point there was a malfunction, but he played it off. The third room was the repair room. In this room was a robot that also had a little show involved with it. At some point the robot started acting strange and this was another sign that things were not always as they seemed. It was all meant to give the impression of a struggling company that was cutting corners. The last room was the boarding area where you would actually board the ride (today this is the only room that is left). The attendant counted off the people and sent them over to board the ride. Since you couldn’t line up behind someone for a lane, this meant that it was the hardest one to get either a front or back seat in the park. This room with that stairs going up to it is the only room left in operations today. The theming did not end there. Going up the hill were strobe lights, fog, and some televisions that essentially were telling you to have a safe trip. Then the TV glitches (on purpose) near the top of the hill. This was once again to reinforce the run-down company image. Through out the ride you are chased by space pirates that damage your craft. You then are warned you will have to make an emergency landing. You circle some planets and then see the planet earth from above as you orbit it. Then they manage to get control of the ship at the last-minute. You then safely make it to the arrival area and leave the ride. Things also started breaking after a few years. First they removed the spiel in the first room. Then the video broke in the second room. Then the robot broke. So you are walking through these theme rooms where nothing happens. By this time you could just walk through and not wait in each room. Then the effects in the ride started breaking. No more TV’s. No more videos or voiceovers. No more planet earth. Today you ride it completely in the dark. Cedar Point gave up on the upkeep of this ride about fifteen years ago. They removed the cool factor that made it an experience. All you have literally have left is Avalanche Run in the dark. The ride is no longer smooth, just a very very rough ride for something that originally felt like a bobsled. I wish I could truly say I will miss the ride. What I miss is riding Avalanche Run with my mother. That experience was gone twenty-three years ago. So while this was a bittersweet loss, I can say I was first angry about with when Disaster Transport showed up (especially after sitting in each room for fifteen minutes for the third or fourth time). Here is some footage someone shot in 1987 that you can see Avalanche Run in operation. Avalanche Run footage starts around the two-minute mark. I couldn’t find any point of view footage of Avalanche Run. We are lucky enough that someone recreated it in Roller Coaster Tycoon 3. You can at least get a feel of the real ride. Here is a point of view video of Disaster Transport. The main problem with this video is how dark it is.